The Hashemite Kingdom of Jordan is a small, mostly landlocked country that sits nestled in between Israel, Syria, Iraq and Saudi Arabia. This heart of the Middle East is ruled as a constitutional monarchy by King Abdullah II. Jordan is a land steeped in some of the most ancient and mystical histories of humanity. The ancient city of Petra is its most famous jewel but Jordan is also home to ancient Roman cities, crusader castles, the river where Jesus was baptised by John the Baptist and the fortress of the infamous King Herod, making it a popular destination for those on religious journeys. The Nabatean city of Petra is one of the most iconic historical sites in the world with its magnificent architecture carved out of pink-hued cliffs. Founded as far back as the 5th century BC this was the capital city of the Nabateans and was an integral caravan centre for the incense of Arabia, the silks of China and the spices of India. This crossroads is mysteriously sat in a seemingly inaccessible location. So secluded is this magnificent necropolis that no one apart from the Bedouin who had made it their home for centuries knew about the place until Jean Louis Burckhardt, a Swiss explorer, happened upon it in 1812. A maze of monasteries, tombs and grand architecture. Another monument to the great civilisations of the ancient world lies in remarkable condition of the Roman ruins at Jerash. Already inhabited when the Romans conquered this land in 63BC, this small town turned into a major city with around 20,000 inhabitants sitting behind her solid Roman walls. Highlights of the remains include the magnificent Corinthium columns, the dominating arch named for the Emperor Hadrian, two lavish temples dedicated to the gods Zeus and Artemis, a hippodrome which played host to chariot races, two well preserved theatres and a quintessential Roman forum where the citizenry could meet for markets and festivals. Then there is the natural wonder of the Wadi Rum which was made famous by the adventures and exploits of Lawrence of Arabia in the early 20th century. This desert landscape is a series of valleys which are lined with massive rocky mountains and hills which come together to form a breathtaking environment. This site is home to the famously hospitable Bedouin today but has been occupied by humans for over 12,000 years. That is why you can discover 25,000 beautiful rock carvings and 20,000 fascinating inscriptions, some thought to include the early development of the alphabet, in this amazing place. Jordan does not only offer insight into the past but looks to the future also. The capital city of Amman is a distinctly modern Arab city which will fascinate any traveller. It is bursting with leafy residential districts, trendy cafes and bustling bars. It is a city that breathes fresh culture with its lively music scene and wonderful art galleries. A landlocked country in the heart of the Middle East, Jordan is filled with ancient history ready to be explored. From the Romans to the Crusaders, many civilisations have played their part in the country’s development. The iconic city of Petra is the main attraction and one of the most incredible sights in the world while the natural wonder of Wadi Rum is a breath-taking excursion. There are also plenty of modern aspects to enjoy with a vibrant capital city ready to be explored. Visiting the modern Arab city of Amman. Sitting in the fantastically preserved Roman Amphitheatre just outside Amman. awesome reach of Ancient Roman civilisation. Discovering ancient ruins at the beautiful wonder of the world that is Petra. Taking a dip in the mystical Dead Sea on Jordan’s western border. Exploring the breathtaking region of Wadi Rum, following in the footsteps of Lawrence of Arabia himself. Meeting the famously hospitable Bedouin people in the desert regions of Jordan. Experiencing the amazing diving sites at Aqaba. If you would like to know more about Travelbag’s excellent tailor-made holidays to Jordan, don’t hesitate to contact us on 0203 139 7074 and speak with one of our friendly and knowledgeable travel experts. The Arabian sun is strong so make sure you have plenty of hats, collared shirts and sunglasses to protect your skin and eyes when you are on the move. Plenty of sun cream of a high factor will also be essential for your trip. If you are travelling in summer (April to October) then the temperatures can reach above 30°C in most regions. Therefore, you should take plenty of lightweight clothes, preferably made of cotton or linen to keep you as cool as possible. If you are travelling in winter (November to March) temperatures are generally much cooler with average temperature falling to around 10°C in December and January. Amman becomes notoriously cold at this time. Therefore, you should pack heavier, warmer clothes for this chilly time of year. January also sees 70% of the Jordan’s annual rainfall so make sure you take some waterproofs. Situated in the heart of the Middle East, Jordan has a very hot and extremely dry climate. 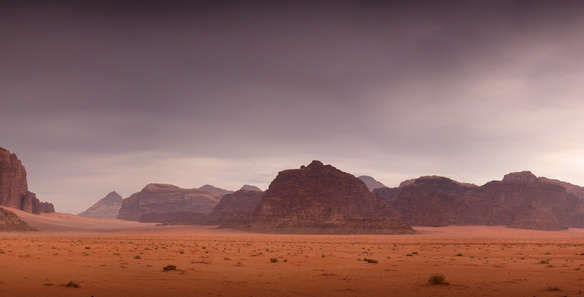 Around 90% of Jordan is made up of desert which means there is only an average annual rainfall of 200mm a year, although this average can be much higher in the fertile hills to the northwest of the country, and can be as low as 25-50mm in some of the more arid parts of the desert. Summer runs from April to October and sees daily temperatures often reach 30°C and above in the daytime. The Sirocco is a hot, dry southerly wind that blows in the summer to the effect of pushing up temperatures and creating strong sandstorms. Winter runs from November to March so is fairly short but does provide a cool reprieve to the sweltering summer months. January is the coolest month, with temperatures falling to an average of 10°C and an astonishing 70% of the average rainfall falling. This influx in rain can cause erosion and flooding.